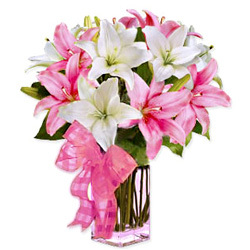 Nuzzle the heart of your partner with a soothing touch of your sentiments for her by gifting her this Overwhelming Flock of Dateless Lilies and magnify the romance connecting you both. 4 sprightly White Lilies and 4 luring Pink Lilies compose this Flock. Note: Vase is not included.